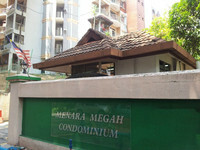 Menara Megah is a Freehold Condominium located at Jalan Kolam Air, 51200 Sentul, Kuala Lumpur. Menara Megah comes with 1 blocks of 17 storey building. The built-up size of the unit measures approximately 1,058 sf in size. All units come with 3 bedrooms. Menara Megah provides facilities such as swimming pool, wading pool, gymnasium, playground, table tennis, cafe, laundry, nursery, covered parking, mini market, surau and 24-hour security. Menara Megah is near to amenities such as public transportation (Rapid KL’s Titiwangsa LRT station and monorail stations), and schools (SK Sentul Utama, SMK Maxwell and SJK Thamboosamy Pillai). The condo is easily accessible via the Mahameru highway, Jalan Ipoh, Jalan Tun Razak, Jalan Kuching and Jalan Sentul. Get me good deal if there is any units available in Menara Megah.